An unprecedented book on option pricing! For the first time, the basics on modern option pricing are explained ``from scratch'' using only minimal mathematics. Market practitioners and students alike will learn how and why the Black-Scholes equation works, and what other new methods have been developed that build on the success of Black-Shcoles. The Cox-Ross-Rubinstein binomial trees are discussed, as well as two recent theories of option pricing: the Derman-Kani theory on implied volatility trees and Mark Rubinstein's implied binomial trees. Black-Scholes and Beyond will not only help the reader gain a solid understanding of the Balck-Scholes formula, but will also bring the reader up to date by detailing current theoretical developments from Wall Street. Furthermore, the author expands upon existing research and adds his own new approaches to modern option pricing theory. 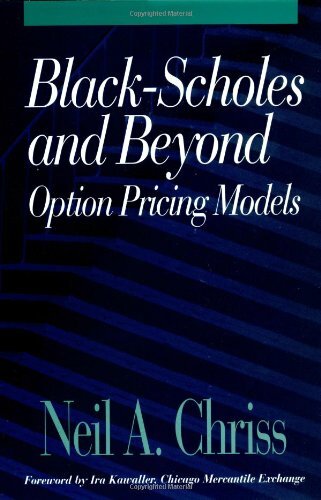 Among the topics covered in Black-Scholes and Beyond: detailed discussions of pricing and hedging options; volatility smiles and how to price options ``in the presence of the smile''; complete explanation on pricing barrier options.